This is our back porch. Honestly, it doesn’t have a whole lot going for it. Pretty basic as far as porches go. I add layers of texture and fabric. The first layer is the rug….actually 2 rugs laid side by side. The room is a funny shape. and fit better than 1 larger rug. Next are the white blinds. The afternoon sun gets a little warm. protect the inside when it rains. of outdoor fabric on eBay. I got this sort of floralish toile, polka dots and a stripe. I made the valances and hung them on inexpensive hooks. The wicker sofa is a Craigslist score. The little chest was on my grandmother’s back porch. It was painted brown…I changed it to white. The shelf unit is from my husband’s bachelor days…seriously. And yes…it was a million years ago! It was in our garage for a long time. I resurrected it when I decided I needed a TV out here. I slapped some white paint on it and it works just fine. I made all the pillows. The green chair cushions are from Pier 1 a few years ago. I recovered the couch cushions as well as the lamp shade. The blue and white accessories are gathered up from around my house. I ordered the little footstools from Fran’s Wicker. the cushions were originally pink. out on my back lawn and spray it white. Other than that there is no upkeep to anything out here. In the fall, I stash all the cushions in big bins in my garage. The most time-consuming thing is cleaning the dang blinds every year! to putting them in my bathtub. The bathtub actually worked well. I let them soak for a while first and they came clean with a good rinse. decided on liquid dishwasher detergent and bleach. another little corner of my world. As always, thanks for visiting my home. Click here to see my 2012 Back Porch Update. When I redecorate it seems chaotic compared to your layering technique. You’ve put things in perspective, thank you. Also, I’m interested in knowing if you porch has windows. Mine is screened, no windows, and I’ve considered installing some type of cover to drop when it rains, perhaps blinds. Any thoughts about it? No there are no windows Jenise…I wish there were! I did have metal mini blinds installed for a few years. I lowered them when it was going to rain but they didn’t do much good. They ended up bending and always got very dirty from the outdoor dust. I would love a porch with real windows but I’m fairly certain that will never happen. I still use it like a room. If something gets wet or dirty, I just wait for it to dry and clean it up! Thanks Ann. Blinds are now a definite no for me. Cleaning up a little water and a bit of dirt is worth having another inviting living space. Wow! What a beautiful change you have done with this porch. The valances are great so as the pillows. Love the cozy atmosphere, eh. I found this from the CSI project and love your new porch! My grandmother is from Holland, and the colors and patterns really remind me of that European look. I think your porch would be great for an Alfresco contest happening on Gilt Home's Facebook. The winner gets $250 Gilt Credit and their alfresco space will be displayed on Gilt Home's FB page. If you're interested here's the contest link, (http://on.fb.me/k1fJQH). Let me know if you have any questions! I can see why this post has attracted so much attention! What a great progression of photos–thank you for showing us exactly how you "built" this room! I LOVE blue and white. And that green is the perfect complement. Way to go! I'm visiting from the CSI Project! Stumbled upon your blog through the Savvy Southern Style site. I love the color palette in this room ! I'm really looking forward to seeing and reading more from you! Thanks! oh my goodness. you have just given me HOPE. our screened porch is hopeless. on the northWEST side. i would not have ever thought to use mini blinds. and all that fabric is so wonderful! I love your porch and it is the post I used on my sidebar for the blog feature of the week. Hi Ann! Wanted to let you know we featured your lovely porch this week on Inspiration Friday! BEAUTIFUL!! Makes me wish I could sew! This looks absolutely fabulous!! You are so talented! It makes me want to just "pop over" to enjoy a cup of coffee with you there in such a cozy and beautifully decorated room! How beautiful. I'm in the process of redoing our sun porch and you have just given me tons of inspiration. Thanks for sharing. Visiting from Laurie's Little Bits of Creativity, etc. Your porch turned out so cozy and comfy. I love it! Hi. Beautiful. What size is the porch? Width & length? Thank you. What a beautiful porch! I am so envious. My "porch" is a 4' stretch of concrete that has to be kept bare because people will steal things from it. If you have any sort of porch at all, enjoy it! :o) You did a wonderful job. What a beautiful porch you've created! You must love it out there. So pretty and summery. Wow, what a lovely job on your porch. I love the black and lime green with the white wicker. Wow, very pretty! 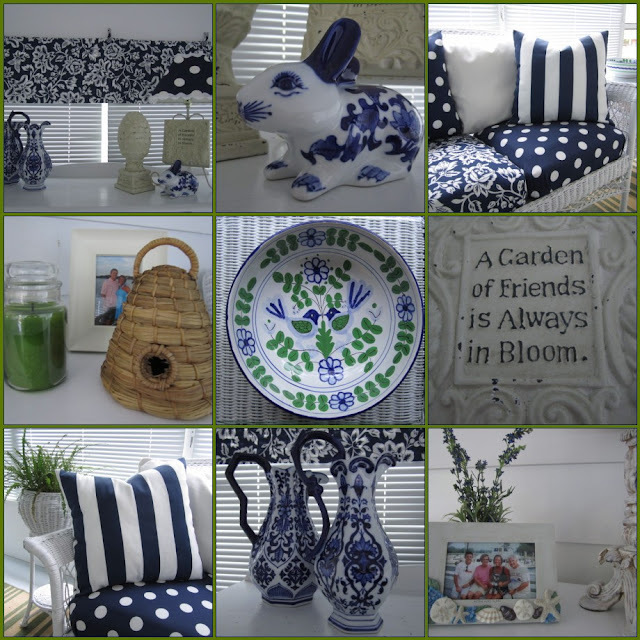 I love blue and white, and with the pops of green it looks spectacular. Ann, just letting you know that I featured it today at Recognition Day Thursday :) Please feel free to grab the feature button in my sidebar. I have always loved blue and green together and so of course this transformation is right up my alley. Just gorgeous! Oh Ann, Your porch is fabulous and I LOVE your colors and patterns. The navy, white and green are so crisp and fresh. And you actually made the pillows? You're a talented woman. I love the wicker, especially the chairs with their foot rests. Oh, I have porch envy! Ya "dun good", Ann. Oh my goodness, I love your color choices! It's so refreshing! Oh please, can I come sit on your back porch??? Just beautiful!!! I would love for you to come over and link up on Thursday! Hi Im visiting from faded charm's white Wednesday. I'm so glad I did as your make over is stunning. You are one talented gal. Happy White Wednesday! What a lovely transformation…it's so gorgeous! Hope you enjoy many lovely days in your new space. Your porch is stunning! LOVE the colors. Spectacular! I like your crisp color choices. Visiting from WW! I am seriously in love with your porch! Everything is perfect! I love the fabric and color combos! Gorgeous porch with the dreamy wicker furniture and punches of navy and green. I love your mosaic too. I was working on four posts in the last couple of days, and have one ready to go on our gameroom. I first tried out the collage there and gave it a caption …" Thank you to Ann @ OnSuttonPlace for teaching me how to create this collage". Then I worked on the other posts and ended up publishing the garden one first that didn't give you credit! I am going to go edit it and add the caption right NOW! Oh wow, this is stunning!! Great work! Oh sweet lady, I love this back porch !!! Especially the cushions love the colors just Beautiful !! I bet you spend a lot of time out there now ! I don't have a back porch but if I did this would be the one for me ~~ Im your newest follower on your Blog now. I will put you on my sidebar so I can come back to see you Ann. I hope you and your lovely family have lots of fun in your new room. This room is to die for !!! Maybe you can come see my new Tablescapes the Island of Jamaica. What a wonderful transformation! Absolutely gorgeous! Your porch is beautiful. Love the before and afters. How you have sweetened it with all the texture and color! BTW I keep on file your fireplace painting before and after. We are trying to make this big decision. If you have time to comment on my blog, let me know if you are still happy with it and if it's hard to keep clean? Did you leave the inside black ? I guess you'd have to. Wow! What a beautiful porch. You did a wonderful job with it. Love all the whites and blues, well done! I was just at my neighbor's house and telling her about your awesome porch….and oh wow, I LOVE those curtains…the whole room is amazing! Hey Ann, I've awarded you the Versatile Blogger Award. Go to my recent post to see what that means. I love your patio re-do! My first response was wow but when I went to write it, I saw that just about every comment said the same thing. So wow, anyway! You are so talented. Love the lamp. These are some of my favorite color combos. I have a bathroom with the same colors except for the blue. You really transformed this space beautifully! I could spend hours in this room! Great colors and love the lampshade! I can't imagine how relaxing this space must be, especially in the evening and early morning! It is just stunning!! But the practical side of me can't help but asking, what DO you do if it rains? It sounds like you just have screens and no windows. It is just lovely and I especially love the valances with the buttons! Fabulous Porch! Love your color scheme! Oh wow, this is gorgeous!!! You inspire me!!! Ann – I love it!!! I really love how it totally warms up the space. The navy and pops of green are perfect with one another. lovely space! What a sweet porch Ann! You've done an amazing job is creating it. Just love your fabrics…the green with the black and white…PERFECT! The wicker ottomans are so sweet, love the shape and how they go pefectly with your chairs. Can I come over and sit a while??? I wouldn't want to leave! Hi! Visiting from Debbiedoos. Incredible looking porch and I loved the way you took pics after each step. We also used to clean our blinds in the bath and then hung them on the washing line to dry. OH this is just outstanding! I love the colors, the wicker, great job on the pillows and the plates on the wall are the crowning touch! WOW your porch looks awesome! Can I come for a visit? I just love everything about it. I wish my porch looked like this. You did a great job. Ohhh my goodness…what an utterly fabulous transformation! My friend, I love everything that you did! 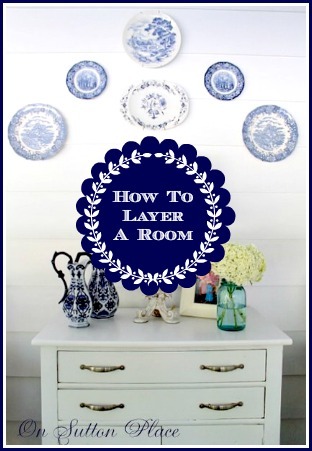 Love, love, LOVE the pretty blue and white fabrics…and the green accent color is gorgeous!!! Wowzer…talk about a fabulous place to spend time…I could spend all day out on this pretty porch! My friend, you did GOOD!!! What a talented designer and seamstress you are! BRAVO!!! PS…and I just love all of your pretty vignettes…it's perfect!!! This is a gorgeous transformation! Yes I am adding you to my blog roll! Wow, what a beautiful transformation! I wouldn't mind relaxing out here for awhile. Nice job. Your porch is so beautiful. You did an amazing job with the fabrics and furniture. The colors are great. Everything looks so fresh and pulled together. I love the dresser and the TV. Oh shoot… like it all. I could see you spending a lot of time on that beautiful porch. I love the fabric you picked and all the work you did looks stunning. I adore how you did the valance. The blinds tip is really so right on, I have tried everything under the sun myself including hanging them on the fence. Not good either. The tub trick works so easy, and all the mess stays confined. wow. I love the transformation! I also love the blue and white plates, and the blue with the green. They're my two favorite colors. Great job! Thank you for showing us the process. What a transformation! What a great space, Ann! You took a plain Jane room and made it fabulous! Just beautiful! Love your colors, the blue and white, oh I love your porch! Wonderful makeover Ann. I love the colors you chose, the fabric and accessories. Fantastic – love it. White is such a pliable colour, you can make a room look completely different just by adding a different coloured cushion. Found you at The Girl Creative and looking forward to linking up. Ann really great design work!! I love it all a total transformation! I have washed blinds like that in the tub too, lol. and, I was also wondering how you did that photo collage. This is beautiful!! I love the black & white and green touches. I'd love for you to come over and link this up to our Wicked Awesome wednesday link party this week, if you get a chance. Ann, I so heart your porch! Lovely, lovely! Really appreciate you sharing this great post with us at the Creative Bloggers' Party & Hop. What a beautiful porch!! Love those colors! WOW!! Nuff said…Wow says it all!!!! Hi Ann,I love what you did to your porch! It looks fantastic! The pillows,and lampshade are so gorgeous.You did such a beautiful job. Your porch is absolutely beautiful. I would SO love a porch! And all those blues. Love! Love! Love! What a wonderful relaxing space. I can just imagine sitting out there to write, dream and read. Ann, I LOVE it, what a great transformation! I think I would spend so much time out there this summer; I would love to have a porch like that! It just looks so comfy, and I love the colors and the different patterns! BEAUTIFUL! That is one beautiful porch!!! Love how you decorated it, so neat! Your porch looks warm and inviting. I love the colors. Great job. Hi Ann, I think it has a lot going for it. I love how it turned out. You can see a lot of time and thought went into it. You will enjoy it very much now. Great color scheme. Thanks for sharing with my newbie party. Ann, this is such a beautiful Sun Room. I love how you showed us step by step, the colors are so cool and bright, gorgeous accessories too. Ann, your porch looks fantastic. I love you how did a separate picture for each addition you made to the room. It was fun to travel through time with you that way. I love the blue and green together. I don't think I would have thought of putting them together, but it turned out great. So vibrant. OMG, Ann, I love this room. Just look at the huge difference filling it up does to the room. Love the color scheme and the lamps add so much to the space. I am a lamp addict though. Cute cute cute room! So pretty! I am so jealous that I don't have a back porch! lol :) Love it! What a great "after", I like how you mixed and matched the fabrics and the accessaries are perfect. This room looks so inviting! Oh my gosh, I LOVE this! Especially that the cushions alternate on that sofa. This is just to die for! I bet you spend tons of time out there now! Great space. Oops. Somehow my sentence got cut off there…..!? I was asking when I could stop by for some lemonade and friendly conversation! No telling where that went! Gone with the wind I suppose. So lovely! When can I stop by for some You did an amazing job and I love the foot stools. It looks terrific! May I ask, how did you make the photo collage at the bottom of your post? I love that. So pretty to show the close-up accessory shots. First of all, your porch is beautiful. Second – that was one of the best before and after posts I've seen – I really enjoyed the details – thank you!